Get the best case for Kindle Touch from the best selling iPAD case manufacturer Acase. This deluxe leather folio will add style and protection to you new Kindle Touch. Compact and lightweight, this case has a leather exterior with a soft micro fiber padding interior. It has a flexible binding to allow you to bend the cover behind the Kindle for easy one hand reading. 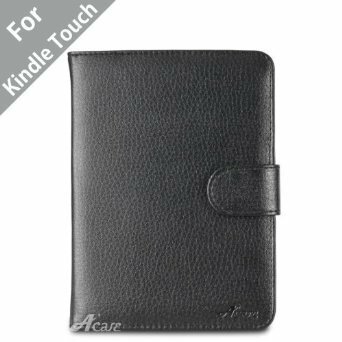 This premium case will provide complete protection for your Amazon Kindle Touch. The case has flexible straps on the top corners to secure the Kindle Touch. Protect your Kindle from unwanted drops and scratches while adding style. Purchase several colors and you can match your Touch to your particular mood for that day. Available in Black, Brown, Pink, Blue, Green, Orange, Red and Purple.